The 2017-2018 school year is our 20th year of coaching math teams in Santa Barbara. The enrichment aspect: The main orientation of the groups is general math enrichment, especially for the elementary schoolers. Some of the topics we cover correlate with the standard curriculum, but there is much more of an emphasis on creative "outside-the-box" problem-solving, and also on special, interesting topics that are not part of typical curricula, such as Fibonacci numbers and fractals. 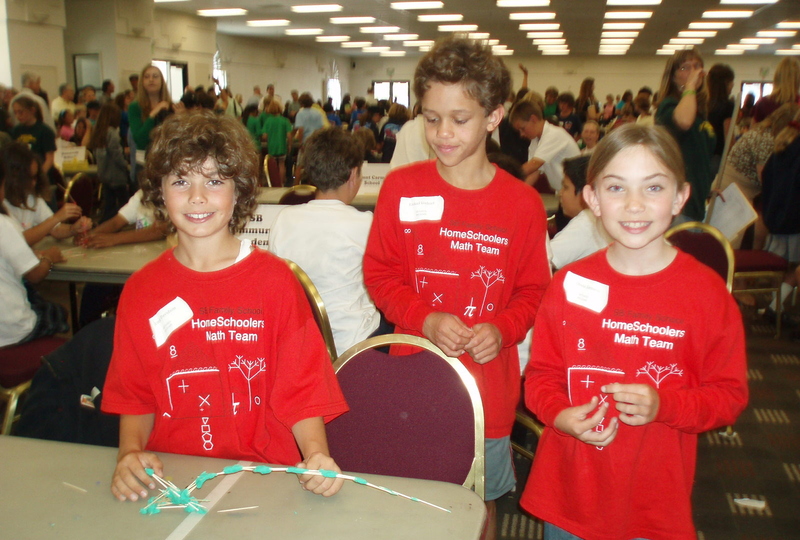 The competitive aspect: We also make use of Math SuperBowl or MathCounts materials (the latter of which conform to NCTM Standards and are endorsed by professional engineers, too) to do team problems, with the emphasis being on cooperation - i.e., working as a team. Although each group participates in competitions (at least one exciting off-site event per year and several low-key ones on site), no individual is required to participate in any competition. For specific information about the various competitions, see the contest chart. The benefits: In addition to broadening their horizons and increasing their math skills, the students learn to do math as teamwork, just as in sports (which is how most professional scientists and engineers do it but is rare in our educational systems). It can also be enjoyable for them to have math be a social experience. The 2017-2018 schedule: Combined grade-level groups generally have weekly 90-minute meetings. The upper elementary school group (grades 4-6) meets from mid-September to early June. The middle school group (grades 6-8) meets from early September to mid-March. 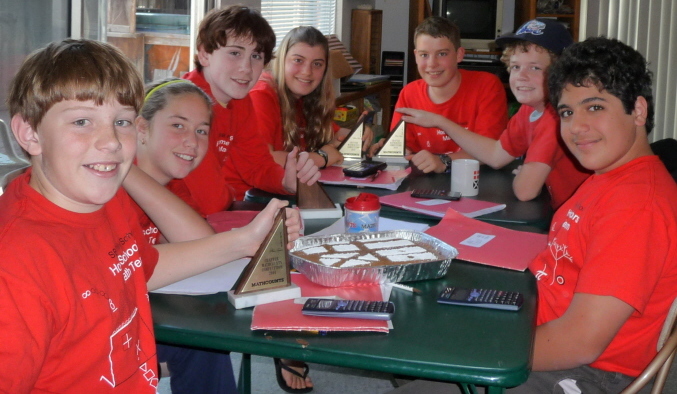 The high school group meets less frequently in the Fall, and ends in early February. All the meetings are located in the math room at my house, which is in Goleta near the corner of Cathedral Oaks and Fairview. The cost is $21 per week, i.e. $14 per hour, if you sign up for a whole season. Otherwise, it's $25 per 1½-hour session. If your child is not sure if [s]he would like this program, [s]he's welcome to try a couple of meetings; then if you decide at any point to make a commitment for the rest of the season, the rate is converted to the lower rate retroactively - so there's no penalty for taking your time to decide to join. All materials are included, except the team T-shirt, and there's a small additional charge for some of the competitions. New sibling discounts and scholarships. Sibling Discounts: The second child is 20% off; the third child is 25% off. For twins or triplets, add another 5% to the discount amount. And I am also still very open to bartering for all kinds of things, especially yard work and housecleaning! References are available among PATH, HBP and Homesteaders families.